The unique visual impact of this versatile 6 piece Cheese Board and Knife Set is the first thing you’ll notice, then the differences will dawn on you. With a magnetic strip along the angled back bar to hold the four included knives and a removable black glass serving tile, it offers two boards in one. 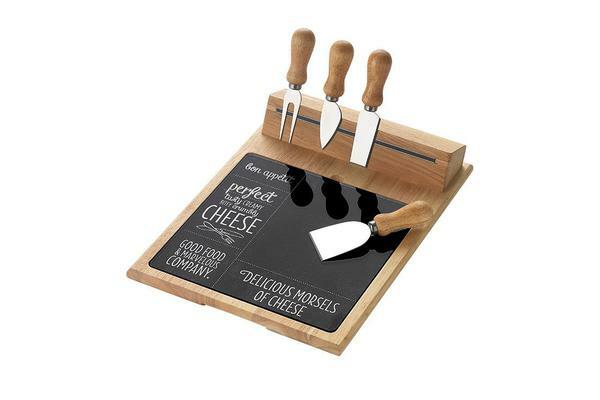 You’ll enjoy more space for cheeses, dried fruit, cold meats and savoury pate as the knives rest securely on the strip, ready for action with no cross contamination of flavours.A compliment to your entertaining style, this set makes an ideal gift.